Klipspringer’s tank, tube, and bottle brushes are ideal for cleaning difficult to reach places, making cleaning an easier and more enjoyable experience. 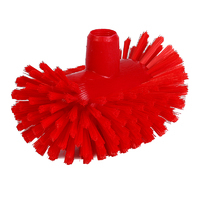 Our tank brushes are packed with water resistant filaments, to ensure that they are not saturated by any liquid when cleaning vats, tanks or any other vessel. Their rounded design make them excellent at reaching every crevice within a vessel, thus providing an exceptional clean. 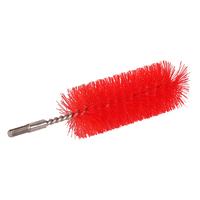 Our tube brushes come in different sizes, in order to provide a snug fit for whatever tube you are cleaning. Klipspringer bottle brushes come in many different diameters of brush, but with a 500 mm overall length as standard in order to be long enough to clean any bottle or cylindrical vessel. Packed with a full complement of water-resistant filaments, these first class performers present symmetrical profile to ensure effective cleaning in cylindrical vessels, cooking vats, tanks etc. also ideal for curved or right-angle connection between floors and walls, or walls and walls, in both production areas and vehicle bodies. Only polyester PBT fibres are used to guarantee lasting performance in water. Designed to effectively clean tubes from 70mm to 120mm internal diameter. 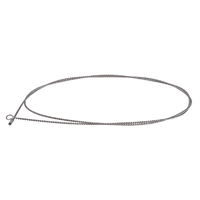 Moulded with internal thread common to the entire range of KsPrism handles, providing flexibility in cleaning lengths demanded. Filament matched to filament length to ensure even cleaning effectiveness in all sizes. This unique configuration of bristles provides a multi-directional effect, protecting delicate surfaces during rigorous cleaning. 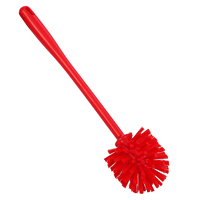 The flagged bristles provide that extra in care and water retention. Useful in tight corners. Recommended for internal washable wall surfaces and vehicle washing. Standardising on 500 mm overall length, this effective range cleans internal dimensions from as little as 7-8mm diameter to as large as 60mm diameter. Hardwearing polypropylene handle carefully shaped for maximum grip. No exposed sharp 'wire' edges prevents equipment damage. 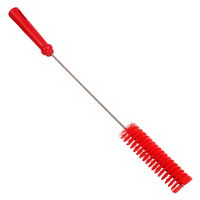 Strong, smooth, extremely flexible with stainless steel connector to detachable tube brush options. 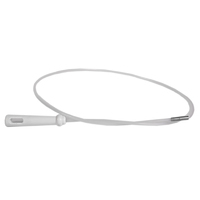 Polypropylene moulded hand grip provides firm comfortable hold. Two options of flexible stainless steel handles – 1500mm and 3000mm. Stainless steel threaded union for a firm connection with the 20, 40 and 60mm Ø tube brush heads. 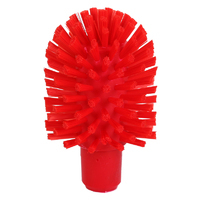 Detachable bottle brush heads (tube brush heads) manufactured from 0.3mmØ polyester PBT bristles carried in stainless steel heavy duty twist which is welded into a stainless male threaded union, providing a firm connection to long flexible handles.Three diameter options are available: 20, 40, and 60 mm in 5 colours. Two useful domed heads - 63mm and 90mm. 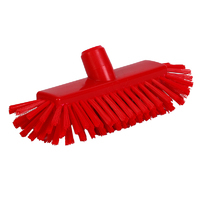 Integral contoured handle and brush stock provides strong rigid brushes for tough assignments. Standardising on 500 mm overall length, this effective range cleans internal dimensions from as little as 7-8mm diameter to as large as 60mm diameter.